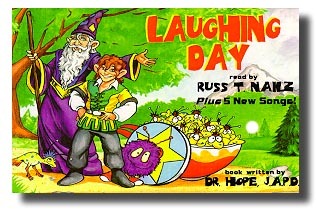 This audio cassette tape has the Laughing Day story acted out with voice actors and special effects. Plus there are five original humorous songs performed by actor/singer/comic RUSS T. NAILZ. 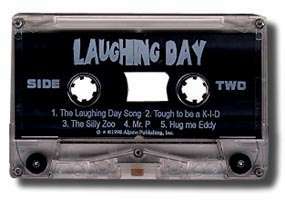 The Laughing Day CD has all of the above Plus the Laughing Day story acted out in Spanish. Order your high quality copy today! Special Bundle-Storybook, Coloring and Activity book, CD and Cassette, buy all 4 together and save! A $49.80 value! "Laughing Day is a delightful book full of important lessons for all of us." "Laughing Day is great. I was impressed with the story but my kids truly love it along with all of the cheerful little songs!" "...this work will touch the hearts of many children." "I hope this will be the first of many... (from Dr. Hope)"
"Laughing Day is a delight! It seems to me we grownups could use a large helping of this (Laughing Day) philosophy as well." "Laughing Day is charming and does exactly what you say it will (delivers a message that will help children throughout their lives"
"On a scale of one to ten my eight year old daughter gave Laughing Day a perfect TEN. I gave it a million kazillion megatrillion maxibrillion, which is the highest rating in the universe!" Murray Langston, "The Unknown Comic"
"Delightful tale with a wonderful message.... Well written, beautifully illustrated." "Thank God for Dr. Hope! We need more books like Laughing Day." "I've been an educator for 28 years... I read your book, Laughing Day and was touched by the message. I read it to some classes of kindergartners and first graders at my school.... without exception, they loved it!" "As an educator I make it a point to read several children's books daily. Laughing Day stands out...because it not only has a beautiful rhyme and rhythm, but the message it spreads is valuable and essential to children of all ages." "I am a mother of four boys and have two young grandchildren. Laughing Day is a wonderful story with a moral lesson we all must teach our children and remind ourselves of." "Laughing Day is an exceptional book destined to become a classic. It is the kind of story that I would read to every one of my classes and should be read by adults as well." "It made me cry. A truly sweet story. My kids loved it and so did all the children at our school." "People should all help each other, just like Oolong did."